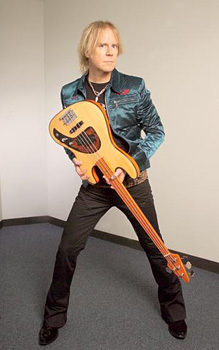 "When I get back to my room after a gig, I turn on my computer and pick up this Alan Tomkins bass I absolutely love, and I play for a little while to wind down. " "Tom’s Tomkins Kimberley 1 is made from exotic Tasmanian Huon pine, slightly arched with binding and purflings. The hand-tooled leather pickguard is recessed into the body. The pickups are Velvet Hammer but I’m sending Tom some Nordstrand pickups, which I’m now using in all my instruments. The neck is hard-rock maple, fitted with a full floating trussrod under the hard-rock maple fingerboard. The neck is finished with orange tinted nitrocellulose lacquer and the body is natural in color and finished with clear nitrocellulose lacquer. The tuners are Hipshot Ultralites and the bridge is a Schaller roller, both in chrome finish."